If you like a colorful backpack and you like wizards then you should check out this Harry Potter colorful crest backpack. As you can see on the picture the backpack has red, green, yellow, and blue in it and it is made by all the house crests of all the Hogwarts houses. The Harry Potter is 12 x 18 x 4 inches and has a big compartment and a back pocket so that you can separate your stuff. 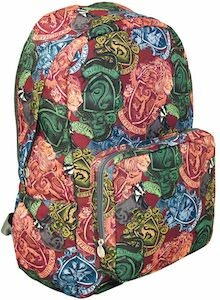 A fun colored backpack like this is great for work, school, and magic adventures so I would click on the picture to see all the options of this bag.